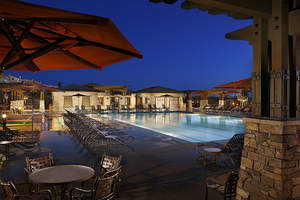 MURRIETA, CA--(Marketwired - Mar 15, 2016) - This summer at Spencer's Crossing, homebuyers will find even more to come home to with four brand-new neighborhoods joining the thriving master-planned community in beautiful Murrieta. Meticulously crafted by renowned homebuilders, these impressive residential collections will offer an array of contemporary single-family detached homes to accommodate every lifestyle preference from growing families to multi-generational buyers. New-home opportunities will include Juniper by Brookfield Residential, an exquisite collection of single-level homes featuring expansive living areas spanning from approximately 3,212 to 3,462 square feet with three to four bedrooms and two and one-half to three baths. Prices start from the $400,000s. The second collection, also priced from the $400,000s, will be Sycamore by Richmond American Homes. Beautifully designed one- and two-story residences will offer well-planned interiors with three to seven bedrooms and two and one-half to five baths in approximately 2,800 to 3,450 square feet of living space. Ashton by Woodside Homes will offer contemporary one- and two-story residences ranging from approximately 2,410 to 3,199 square feet with three to four bedrooms and two to three and one-half baths. Prices start from the high $330,000s. Priced from the $300,000s, Brookfield Residential's Nectar will round out the master-plan's newest offerings with gorgeous one- and two-story home designs extending from approximately 2,112 to 2,853 square feet with three to five bedrooms and two to three baths. Homebuyers interested in learning more about these exciting new home neighborhoods are encouraged to register today for updates on future happenings at www.SpencersCrossing.com. "Spencer's Crossing is already Murrieta's premier master-planned community and the addition of these four beautiful new home neighborhoods will elevate its appeal to even greater heights," said Mercedes Meserve, Vice President of Marketing for Brookfield Residential Southern California. "Homebuyers eager to experience these new opportunities should register on the Spencer's Crossing website for news and updates as we move closer to the summer debut dates." Spencer's Crossing seamlessly blends rural charm, robust recreation and the comforts of home to create a 600-acre haven made for the best of family living. The dynamic environment offers miles of meandering trails to explore, as well as resort-style amenities that include a 3,500 square-foot recreation center with a swimming pool, children's wading pool, spa, BBQ area, shade structures and playgrounds. The community's 11.5-acre Sports Park provides endless opportunities for fun with lighted soccer and baseball fields, a basketball court, tot lots and a concession stand. Set in picturesque Murrieta, homeowners living within Spencer's Crossing will enjoy a prime location near popular shopping centers, great restaurants and golf courses, while Temecula's beautiful wineries and other attractions are just a short drive from home. Families will enjoy inclusion in the high-performing Murrieta Valley Unified School District's Lisa J. Mails Elementary School, Dorothy McElhinney Middle School and Vista Murrieta High School. To visit Spencer's Crossing from Temecula, take the I-15 North, exit Murrieta Hot Springs Road and head east past the 215 Freeway. Turn left on Winchester Road (Highway 79), left again on Max Gillis and right on Leon Road into the community. From Riverside take I-15 South, exit Bundy Canyon and head east past the 215 Freeway. Turn right on Leon Road into the community. Spencer's Crossing Recreation Center and swimming pool.